THIS ABOVE ALL. This is your speech. You must own the speech. Do not let anyone else, expert or coach, persuade you otherwise. Yes, be guided by experts, coaches, and all feedback, but you must retain ownership. This is your opportunity to contribute. And to connect. And to serve. And to shine. A great speech is built on 4 pillars: Clarity, Brevity, Levity, Charity. Ted Sorensen developed a style of speech writing that can be boiled down to six basic rules. I always try and be guided by these. Less is almost always better than more. Choose each word as a precision tool. Organize the text to simplify, clarify, emphasize. Use variety and literary devices to reinforce memorability, not confuse or distract. Substantive ideas are the most important part of any speech. A great speech has: An Outline, A Headline, A Frontline, A Few Sidelines, A Bottomline. A headline – what’s the news, what do you want the public to take? A front line – what’s the most important point? A speech is made great, not from the words used, but from the ideas conveyed. If the ideas, principles and values and substance of the speech are great, then it’s going to be a great speech, even if the words are pedestrian. The words can be soaring, beautiful and eloquent but if the ideas are flat, empty or mean, it’s not a great speech. Speechwriting really comes down to four words and five lines. The five lines are: Outline. Headline. Frontline. Sideline. Bottom line. Before you ever start writing your talk, be very clear on your message. You should be able to reduce your message (or each point) to a single sentence or idea. Every citizen can be a better citizen by becoming a better public speaker and storyteller. Every professional can be a more successful professional by becoming a better public speaker and storyteller. Verify that your topic is relevant and appropriate for your audience—i.e. know your audience’s needs. Decide on what you want the audience to (1) Know (2) Feel & (3) Do. I want my audience to know that they can become more successful by taking up public speaking and storytelling. I want my audience to feel energized by experiencing the power of public speaking and storytelling. I want my audience to commit (do: action item) to acquiring expertise in public speaking and storytelling. Start with the end in mind. Deciding on the closing. Write out the ending, which must hammer home the key message. Decide on the final emotion you want to leave your audience with. Write an ending that will leave the audience with this emotion. Write out a strong opening. Must grab attention earliest. Sadly, in the next 18 minutes when I do our chat, four Americans that are alive will be dead through the food they eat. Write out a road map. Today I want to tell you 3 stories from my life. That’s it. No big deal. Just three stories. Decide on and insert transitions. If you are going to use slides, this is the time to create them—not earlier. If you are going to use other props, this is the time to decide how & when to incorporate them. Check the draft against some checklists. Run it by friends or colleagues who do not have your level of subject matter expertise or knowledge. The curse of knowledge blinds us all. Is it clear and simple? Give the speech conversationally—without sticking to the script—and record it. If you plan to memorize your script, then this is the time to start. Use the “Memory Palace” technique. To learn more. Joshua Foer @ TED. You have not memorized your script well enough till (1) you can recite it at twice your normal speaking speed, or (2) you can recite your speech aloud while simultaneously doing another task that requires mental energy and concentration. i.e. till it has become part of implicit memory–as opposed to explicit memory. Practice in feedback rich environments repeatedly, edit repeatedly, and refine. Convert the final version to reading notes or cue cards. Practice even more in feedback rich environments. Transition to Greeting and RoadMap. Clear transition to Q&A / Discuss and Debrief session. Q&A / Discuss and Debrief session. Clear transition into strong closing. Do I have something worth saying? Am I making a contribution? Do I know my audience? Is my message audience focused? What do I want my audience to KNOW, FEEL and DO after hearing my presentation? Is my message focused and clear? The most common issue with beginner speakers and 1st drafts is that they cover too much. Limit the presentation to that which can be explained with examples and stories—in the available time. Do I have a strong closing? A strong opening? A clear roadmap? Good transitions? Is my talk characterized by CLARITY, BREVITY, LEVITY and CHARITY? Have I included stories and examples to support main points? If I am using visuals, are they too crowded? If slides take more than 2 – 3 seconds to fully comprehend, they are too crowded. Have I practiced enough? In front of numerous and diverse audiences? Am I being authentic? Do I come across as authentic? Top Guideline: A slide, like a headline, should take no more than 2 to 3 seconds to comprehend. Single images, or very few words, do this best. Top Caution: Beware the temptation to create fancy feature filled slides that communicate anything other than your core message. The WOW factor is ephemeral. You will do fine without it. A PowerPoint is not the presentation. It is only a collection of slides. Each slide is only a visual aid: nothing more. You—your presence, your audience connection, your useful content, and your commitment to contribution—are the presentation. The time to use a slide is when it conveys ideas and information with greater “clarity and brevity” than the spoken word alone. A bad slide is worse than no slide. It takes your listeners’ attention away from you—breaking your connection—and causes confusion or distraction in your listeners’ minds. My top recommendation for individual slides is “keep them super-simple”. Images do this best. Few words of text do this well. I stay away from SmartArt, flashy transitions etc.. I ask myself: “What is the worst that will happen if I don’t use this fancy—and distracting—feature?” This keeps me anchored to basics and core message. Regarding formatting, I stay with one primary font, and change format (color, size, font) only if it contributes to clarity and brevity. I study slides of excellent presentations, especially Apple product launches and TED Talks. Suggest you do the same. Here are two examples of presentation with optimal slides. Notice the slides have only a support role. The slides are visual aids: nothing more. And here is an example of a superb presentation with NO SLIDES. Ken Robinson @ TED. 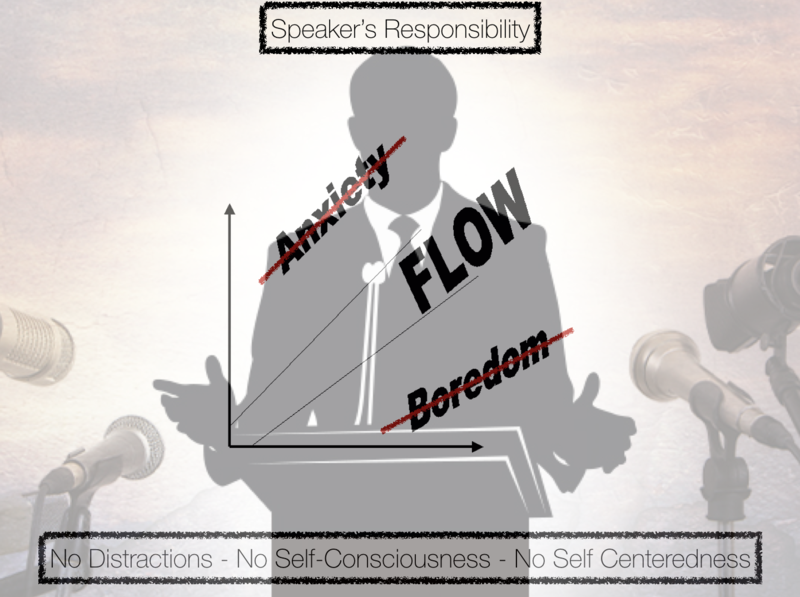 Notice how your attention never deviates from the speaker. Be thoroughly familiar with this HBR article “How to Give a Killer Presentation” by Chris Anderson. Will it make a difference to the audience to have this knowledge? Is the information fresh, or is it already out there? Can I truly explain the topic in the time slot allocated, complete with necessary examples? Do I know enough about this to make a talk worth my audiences time? Do I have the credibility to take on this topic? What are the 15 words that encapsulate my talk? Would those 15 words persuade someone that they’d be interested in hearing my talk? These tools can be mixed & matched. Some talks use only one tool. Some use all five. Use the ancient “Memory Palace” to memorize your speech. Watch Joshua Foer using a “Memory Palace” to memorize his TED Talk. “Never give a “Speech”, says Richard Greene. In this masterful talk, he explains how the great speakers in history use 7 secrets and how we can all become a great speaker by following these secrets and by not just giving a “speech” but rather creating “conversations” from the heart. Learn about the three basic hand/palm positions and what they convey. Caroline Goyder shares a story of moving from stage-paralysis to expressive self. Accompanied by an unusual prop, she encourages us to use our voice as an instrument and really find the confidence within.